When people heard we were building something in Carrara, they thought no one would come here as the whole area is far from the city centre, so it was an unlikely choice of site, because it was a floodplain and not then a very popular area. Because the site is very low, it was very difficult to obtain all the approvals as well, so it has taken a lot of time. But right now it’s really changing, and of course, we were really lucky because when we first had the idea, it was still unknown that Carrara was going to be the home of the Commonwealth Games. It was only after the project started that the other stadiums were also built and this area now is completely different to what it was seven years ago. As for us, we have European tastes and this project is really big and special and we wanted to have really a special architect for this special project. We wanted to be different, so that is why it was important to find the proper person to design it. And, the project is very personal, so we wanted to find a person we could connect with, who could understand us, listen to us, and create something different. I met Hiromi through [KDV project director] Wim Steenbeek, and he recommended her because of the projects she’d participated in, and she’d worked already for a big architect beforehand, so she was experienced. Wim was confident in Hiromi, and his trust in her was important to our decision. Our first brief to Hiromi was that this was a big facility but it should be transparent, it shouldn’t be intimidating, it should be visible and welcoming, and transparency was one of the criteria, with lots of daylight in its design. So, its design shouldn’t be too decorative, of course, but Hiromi is very strict in using minimal elements, without too much detail, and so, yes, it’s a simple structure, but very classy. When Hiromi presented her concept, it was love from first sight. We loved it, and when you see it and you love it, you don’t want to change it. Then, we could see immediately, the person and our personal connection, and we thought yes, we have to trust her. And now, we are going to build the hotel as well, which is very different and that is Hiromi’s too. Some people are scared to come here because it is too beautiful, it looks too expensive and that’s what we had to struggle with, being too good to attract everyone. When you have a big puzzle, every piece should be on display, so we have the facility, we have the program and now everything is working. Before, we had to travel to some other sports facilities and centres, and now I feel very proud, I love all the competition I see, and I am very comfortable because we have everything. We work here, and, of course, we have to be proud of it. But it is true, and I talk to lots of different people and, of course, they say it is such a good place, it is a beautiful facility and we are so proud that you have it here. It really is a nice place. This area now is completely different to what it was seven years ago. Then, Carrara had a lower social demographic, but then they started developing, and the house prices started going up as the whole area started to grow. Now, we look different to everyone else, and the academy is unique in its appearance. When I first started, I’d tell people I was working at KDV Sport, and they didn’t really know what that was. Then, I’d say it’s the Carrara Gardens golf course, and everyone knew that, and they’d say oh, that glass building, because there is nothing else like that anywhere near. It’s a really iconic landmark. And I was having this conversation with some people on the weekend about [a potential rival] and I told them I am personally not scared about them as competition because we are a training facility, and they are in hospitality, and that is a different market and theirs is just for casual golfers. Unlike them, we want initially to be recognised as the best golf and tennis training facility in Australia, and what we want is to develop the next superstars, the next tennis players. And our goal is much more about developing the next generation of tennis players and golfers. Now, some of the world’s top international athletes have been here. Pat Rafter, Pat Cash, Ashley Bartee, Sam Stosur, they have all come here to train, too, so that’s pretty good, and obviously us winning the commercial architecture award is good for us. We’ve also had Casey Stoner [now-retired Australian professional motorcycle racer, and twice MotoGP World Champion] play golf here. We’ve had some of the Gold Coast Suns AFL players here on the weekend, I had one of the players come over on Friday with some indigenous kids. The big picture is that this facility is attracting attention from the top talent. Now, with the accommodation we are building with Hiromi, that steps us up on that international stage, and it’s not just about just tennis and golf any more, it is international in both ways. One is bringing top international sports students here, but internationally, it is about the connections we can make as well. That really takes us from being not just one of the best facilities on the Gold Coast, but potentially in the world, too, so building the accommodation for us will be massive as far as the next step in where we are headed. For Shiro, this is welcome acknowledgement indeed. “This [Shiro Architects’] proposal addresses the corner and Jubilee Park with two different geometries – a curved tower addressing the corner and a rectilinear stepped building addressing the park. Please download a hard copy of Shiro Architects’ Parramatta design excellence competition summary here. I have known Hiromi Lauren (née Shiraishi) for more than a decade. 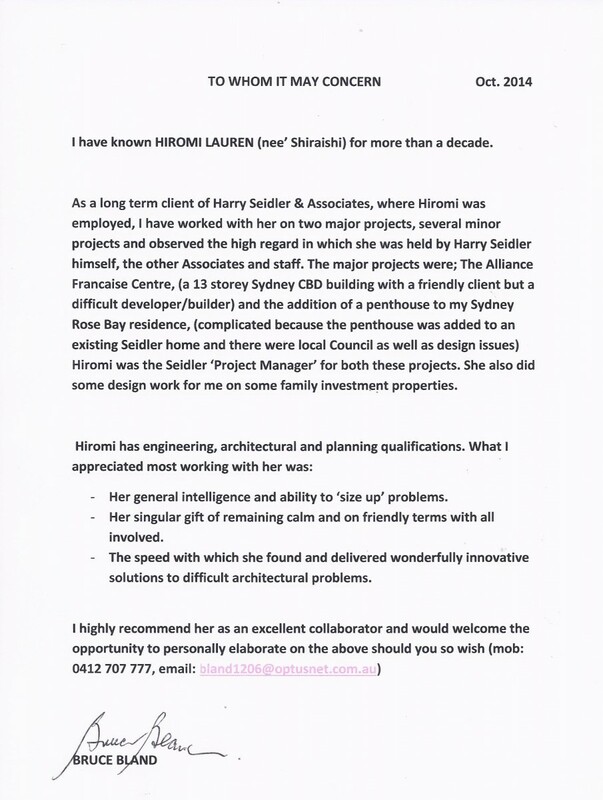 As a long term client of Harry Seidler & Associates, where Hiromi was employed, I have worked with her on two major projects, several minor projects and observed the high regard in which she was held by Harry Seidler himself, the other Associates and staff. The major projects were The Alliance Francaise Centre, (a 13 storey Sydney CBD building with a friendly client but a difficult developer/builder), and the addition of a penthouse to my Sydney Rose Bay residence, (complicated because the penthouse was added to an existing Seidler home and there were local Council as well as design issues). Hiromi was the Seidler ‘Project Manager’ for both these projects. She also did some design work for me on some family investment properties. – Her general intelligence and ability to ‘size up’ problems. – Her singular gift of remaining calm and on friendly terms with all involved. – The speed with which she found and delivered wonderfully innovative solutions to difficult architectural problems. Bruce Bland’s original testimonial is embedded beneath.